A primitive stone tool lies in sedimentation on the gallery floor, marking the origin of man and the development of rudimentary engineering. For the site-specific work ‘The Clearing’, situated on the gallery’s far wall, Huyghe has mechanically sanded down layers of paint from the wall’s surface to reveal expanses of colour that had previously been covered over. Huyghe’s interest extends beyond the line and colour created by ‘The Clearing’ and into the geological formation of the wall; the limestone in the resulting deposit refers back to the particles that emerge from human remains. Huyghe explores the wall as a living artefact, and highlights the perpetual transformation of the gallery as a sphere. Three aquariums placed in the gallery contain biotopes transplanted from Monet’s ponds in Giverny, the geo-engineered site made in 1893 and the subject matter of his ‘Nymphéas’ paintings. The water lilies floating on the surface of Huyghe’s ponds can be viewed constantly. The sides of the aquariums are encased in switchable glass that conceals their contents, then randomly exposes the living organisms that lie under the surface of the painted subject. 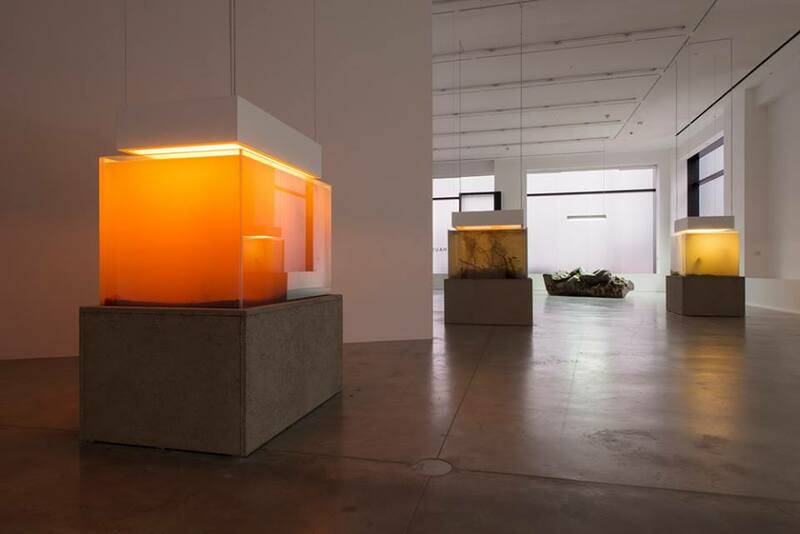 Unlike Huyghe’s previous aquariums, the focus of these pieces is the sunken man-made objects that have been modified over time by natural elements. The lighting sequence for the aquariums is programmed according to a fast-paced rendering of the variations in weather conditions as recorded at Giverny between 1914 and 1918, when Monet painted the ‘Nymphéas’, now situated in the Musée de l’Orangerie. The sequence for each aquarium spans a specific, symbolic length of time: the shortest day of the year in 1914, the autumn of 1917 and the entire four-year period. The ‘Human Mask’ film is inspired by a real situation in Japan, in which a monkey – wearing the mask of a young woman – has been trained to work as a waitress. The film opens with footage of the deserted site of Fukushima in 2011, the camera functioning as a drone scaling the wreckage. This is followed by scenes of the monkey alone in her habitat, silhouetted against the empty, dark restaurant. In this dystopian setting, an animal acts out the human condition, trapped, endlessly repeating her unconscious role.